As a virtue, loyalty has an ambiguous place in our thinking about moral judgments. We lauded the loyalty of firefighters who risked their lives to save others on 9/11 while condemning the loyalty of those who perpetrated the catastrophe. Responding to such uneasiness and confusion, Loyalty to Loyalty contributes to ongoing conversation about how we should respond to conflicts in loyalty in a pluralistic world. 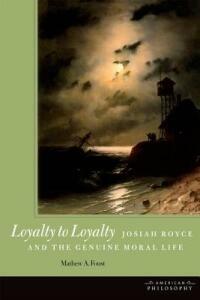 The lone philosopher to base an ethical theory on the virtue of loyalty is Josiah Royce. Loyalty to Loyalty engages Royce's moral theory, revealing how loyalty, rather than being just one virtue among others, is central to living a genuinely moral and meaningful life. Mathew A. Foust shows how the theory of loyalty Royce advances can be brought to bear on issues such as the partiality/impartiality debate in ethical theory, the role of loyalty in liberatory struggle, and the ethics of whistleblowing and disaster response.